Mitchell-Innes & Nash is pleased to present an exhibition of new paintings by Daniel Lefcourt at the gallery’s Chelsea location at 534 West 26th Street. Titled Terraform, this will be the artist’s second solo exhibition with the gallery and will feature a set of eight large-scale paintings. Throughout his career, Lefcourt has engaged painting through the lens of scientific, industrial and military imaging technologies. For his latest work, he has created a set of paintings each depicting an abstract landscape seen from an aerial perspective. 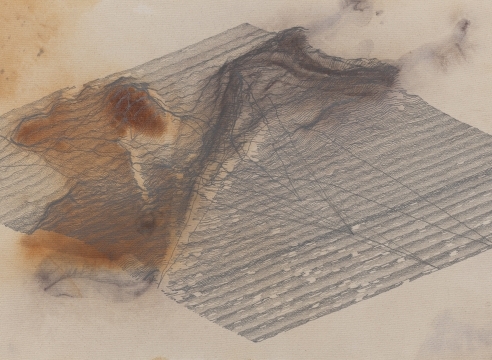 The landscapes do not describe real places, but are generated by staining the canvas and then tracing the stains using algorithmically plotted lines. Sometimes the line drawings are map-like or diagrammatic; in other instances, landforms are described using hatching and linear perspective. The paintings speak to a history of art derived from computation and indeterminacy. A history that includes the generative systems of the artist Hanne Darboven and the parametric musical scores of Iannis Xenakis. The aerial view is of interest to Lefcourt because it is a particularly modern and technological vantage. It is also a gendered perspective. It correlates with masculine fantasies of dominance, as well as metaphysical and technological omnipotence. The bird’s-eye view in the paintings bring to mind drone footage from America’s global military operations, satellite data of melting glaciers, and the camera movement in contemporary video games. Borrowing a popular term from science fiction, the title of the exhibition, Terraform, alludes to the influence of authors such as Ursula K. Le Guin and Kim Stanley Robinson. The authors’ respective works broach the economic and environmental consequences of our current socio-political landscape by constructing elaborate fictional worlds. Likewise, Lefcourt’s paintings offer a vehicle by which we might think on a geological scale, reflect on our current condition, and imagine other possible futures. Please click here to read the essay by Claire Lehmann published in conjunction with the exhibition.